Gorki is a one-of-a-kind theater. For me, it was the first one to get me excited about drama: our English class went to see Romeo and Juliet in a modern but still faithful, multimedia version with video projections and lots of references to current topics. Another theater that stuck with me was about the conflict between Israel and Palestine reflected in groups of Muslims and Jews living in the multi-cultural district of Berlin-Neukölln. 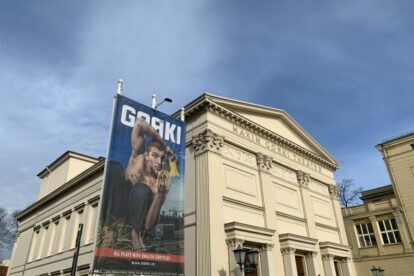 The Maxim Gorki Theater is the smallest one in Berlin, but it has a lot to say. On a side note: when I was studying, I also liked eating at their cafeteria from time to time, if I was not in a rush. You queue up with the theater people and sometimes have to wait a little bit for a spot to open in their beautiful backyard garden. But in the end, it is always worth it – as is the Maxim Gorki Theater in general. PS: All plays have English subtitles!